Some pictures from some of our previous A Magical Evening fundraiser shows. 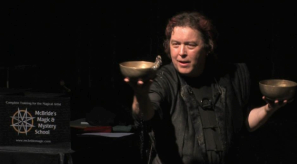 Las Vegas magician Jeff McBride performs his world famous Water Bowl Illusion. Thank you so much for coming all the way to Vancouver to support our show! Your generosity with your time and talents are so very much appreciated. Internationally acclaimed magician Vitaly Beckman receives a standing ovation for his amazing performance at our 2017 A Magical Evening Show. 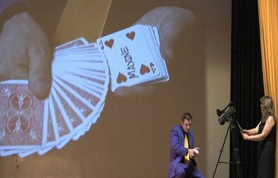 World Champion of Magic Shawn Farquhar performs his award winning routine “Shape of My Heart”. A huge thanks to Shawn for his friendship and ongoing support of Celebrate The Child! During our 9th annual A Magical Evening show our crowds were highly entertained by the comedy magic of Steve “The Pretty Good” Hamilton from Seattle, Washington. Thanks for your friendship and for coming all the way to support our event! Like a silent movie come to life, Paul Romhany brings the visual comedy of Charlie Chaplin back to life in this International Award Winning Magic Act, considered to be one of the most entertaining and original acts in magic today. Paul has kindly been part of our A Magical Evening show in 2015 and as our feature performer in 2016. Salamander the Great aka Bruce Hunt encounters some challenges when his show (or is it shoe) goes awry. In 2014 Salamander received a Gold Medal from the Pacific Coast Association of Magicians for his hilarious brand of comedy magic.